An exclusive first look at an upcoming documentary chronicling Princess Diana's life and death debuted on "Good Morning America" today, just days before the late princess of Wales would have turned 56 years old. Diana's sons, Princes Harry and William, and William's wife, Princess Kate, will gather Saturday, on Diana's birthday, to rededicate her grave in a private service presided over by the Archbishop of Canterbury, Kensington Palace announced Wednesday. Prince George and Princess Charlotte will also attend. Diana's former husband, Prince Charles, is currently on a royal tour in Canada with Camilla the Duchess of Cornwall and will not attend the service. Diana's grave, which is not open to the public, is located on an island on Oval Lake on the grounds of her family home, Althorp House in Northamptonshire. Also gathering at Althorp House will be Diana's family, including her two sisters, Lady Sarah McCorquodale and Lady Jane Fellowes, and her brother, Lord Charles Spencer. Spencer, who walked with Harry and William in the procession behind Diana's coffin at her 1997 funeral, is speaking about his sister in a U.S.-television interview for "The Story of Diana." 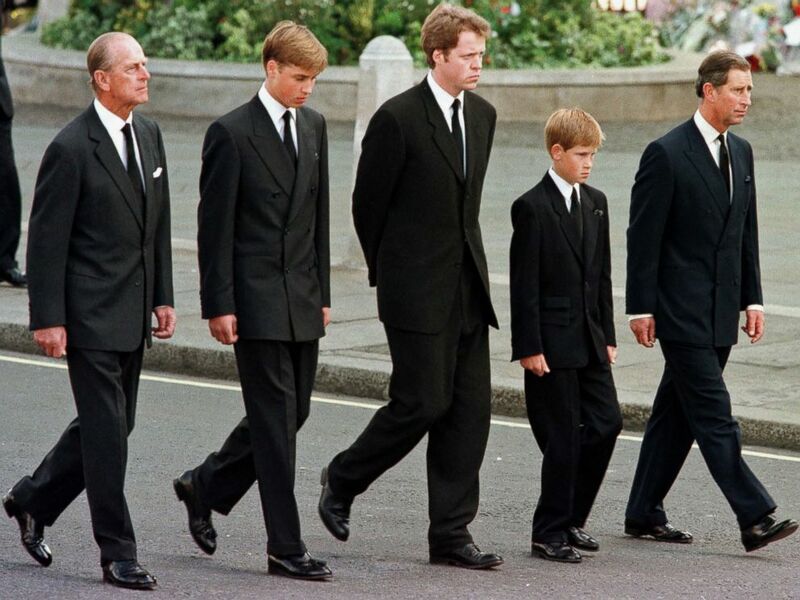 Britain's Prince Philip, Duke of Edinburgh, Prince William, Earl Spencer, Prince Harry and Prince Charles, Prince of Wales walk outside Westminster Abbey during the funeral service for Diana, Princess of Wales in London, Sept. 6, 1997. "One of the reasons I want to talk now is because I think that after 20 years someone shifts from becoming a contemporary person, to one of history," Spencer said in the four-hour documentary, which will air on ABC in two parts this August. "And Diana deserves a place in history," he added. "This was a special person, and not just a beautiful one." Spencer, 53, reflected on his sister's legacy nearly 20 years after her untimely death at age 36 in a 1997 car crash in Paris, saying how she remains loved and remembered by so many as "a force for good." "Obviously 99.9 percent of the people had never seen her, or met her, but they felt something in her that was fascinating and intriguing, and a force for good," Spencer said. British fashion designer Elizabeth Emanuel, who helped design Diana's wedding dress when she married Prince Charles said it was Diana's "vulnerability" that made the public fall in love with her. "She was a human being with all the vulnerabilities of a human being," Emanuel said in the documentary. "It brought her very close to all of us." Princess Diana in a Catherine Walker dress and jacket dress embroidered with sequins and pearls, known as the 'Elvis Dress', on an official visit to Hong Kong in 1989. Another aspect of what made the Diana relatable to millions was her fierce love for her children, William, 35, and Harry, 32. "Nothing in her life came close to the love for her children," Spencer said of his sister. "They meant more to her than anything." Spencer recalled how "furious" Diana was one time when she had taken Harry to school and a reporter who was filming Harry represented him as a rude child in a story after Harry stuck his tongue out at the camera. "And it was this sheer dishonesty of it that they were trying to say he was this impossibly rude little kid whereas they had actually provoked it on purpose. Diana felt furious about that," Spencer said. Now Harry is carrying on his mother's legacy in humanitarian work, and speaking openly about his own grief following her death. "My mother had just died, and I had to walk a long way behind her coffin, surrounded by thousands of people watching me while millions more did on television,” Harry, who was 12 when his mom died, recently told Newsweek about the day of Diana's funeral. “I don’t think any child should be asked to do that, under any circumstances. I don't think it would happen today "
Harry has also admitted he was in "total chaos" and nearly had a breakdown in his 20s. He credited William with encouraging him to get counseling to deal with his grief. Harry and William harnessed that energy to launch, with Princess Kate, the Heads Together charity that aims to break down the stigma surrounding mental health. 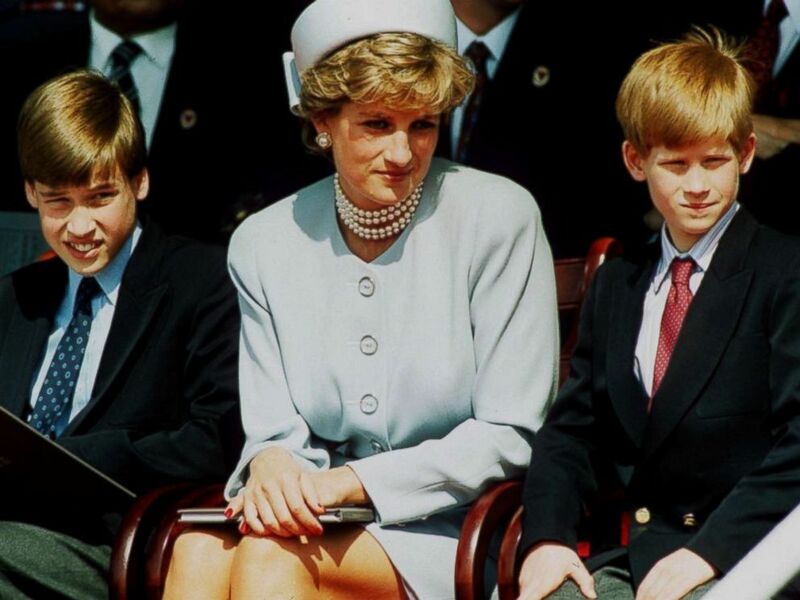 The brothers are marking the 20th anniversary of their mother's death by commissioning a statue of Diana that will stand in the public gardens of Kensington Palace in London. Kensington Palace is also home to a stunning memorial garden that opened in April to mark the 20th anniversary of Diana's death and to honor her life. "Diana: Her Fashion Story," an exhibition chronicling Diana's evolving style during her life, opened at Kensington Palace in February. "The Story of Diana: Part One" airs Wednesday, August 9, at 9 p.m. ET and "The Story of Diana: Part Two" airs Thursday, August 10, at 9 p.m. ET on ABC. The project is produced by Time Inc.’s People.